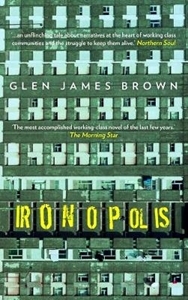 Ironopolis is a warren of streets, memories and people with secrets ... Glen James Brown orchestrates a remarkable novel across these streets as Ironopolis tells its own story across three generations. Jean unveils a secret on her deathbed ... Alan unravels the truth of his father, who has haunted the Burn Council Estate for a lifetime ... Corina is trying to get through one last day at the hairdressers before closing it for good. And then there is the ageless Peg Powler, part myth, part reality and her reason for stalking them all.